Ruby black color. Aromas and flavors of latte, chocolate nut fudge, mincemeat pie, and hint of back bacon with a silky, bright, fruity medium body and a refreshing, medium-long finish imparting shades of pickled sour cherries and tomatoes, pomegranate vinaigrette, pine peppercorns, and cedar with well-integrated, chewy tannins and moderate oak flavor. A savory palate stimulating shiraz for pleasure now or later, let this aerate for a bit. Bottom Line: A savory palate stimulating shiraz for pleasure now or later, let this aerate for a bit. 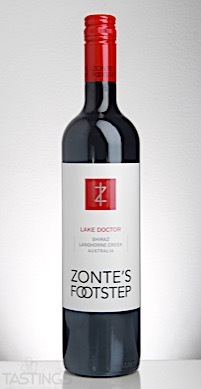 Zonte’s Footstep 2016 Lake Doctor, Shiraz, Langhorne Creek rating was calculated by tastings.com to be 92 points out of 100 on 9/17/2017. Please note that MSRP may have changed since the date of our review.